Something I always tell my students is, “you never know.” As in, you never know what making art and putting it out there in the world will create in your life. About two years ago, I received an email from a man named Josh. 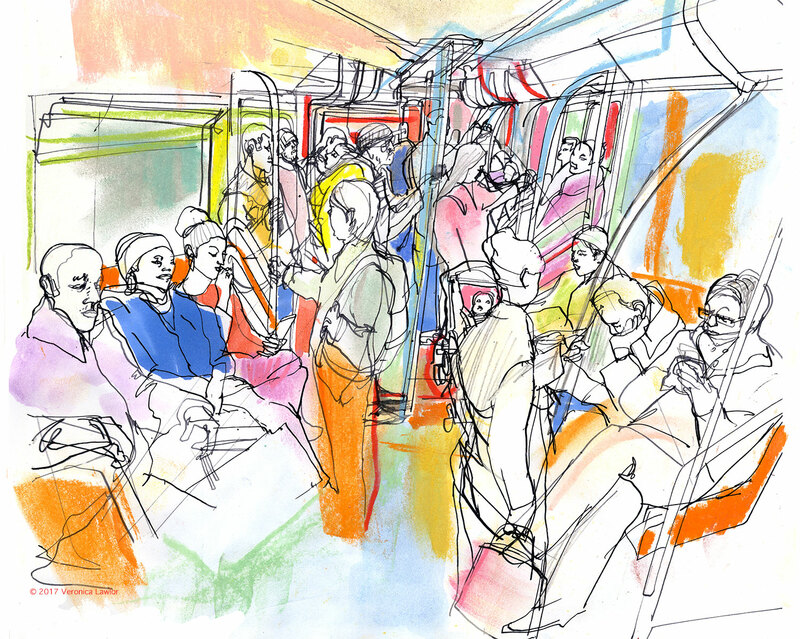 He had written a poem about the humanity on the NYC subway and had seen my work online, including (I assume) some of the many subway drawings I do to practice people. Josh had this idea that I should illustrate his poem, and that he would present the package to the MTA for publication. He asked my fee for doing the work, and was very sincere in his offer. “How about February?” I offered, expecting that I probably would not hear from him again. On February 1, I received an email – was I ready to do the illustration now? LOL. And so it went, and Josh was very persistent. Now I understand the persistence – a big part of success is drive, and obviously Mr. Sapan has been quite successful. I really enjoy working with Josh, who is a very nice and down-to-earth kind of man. His poem and my illustration are now being offered together as a postcard in the New York City Transit Museum store in Grand Central station and in their museum store in Brooklyn, with all proceeds being donated to the museum; a wonderful honor. The illustration is also on the cover of the current issue of 34th Parallel magazine, in which his poem is reproduced. I won’t reprint the poem here- for that you’ll have to visit the museum store and purchase the postcard! Thanks Josh, for recognizing a fellow New York City subway lover, and for being so persistent. :) Like I tell my students, do what you love, and put it out into the world. You just never know who will appreciate it.